An Indian paramilitary soldier stands guard as voters wait at a polling station in Bangalore, India, May 12, 2018. India's southern state of Karnataka headed to the polls to elect 224 lawmakers. Millions of voters in India’s southern state of Karnataka cast ballots Saturday to choose a regional government in a poll expected to set the stage for national elections next year. Prime Minister Narendra Modi’s Bharatiya Janata Party hopes to wrest the key state from the opposition Congress Party and sustain a streak of impressive wins since it swept to power in 2014. The poll is even more crucial for the Congress party: Karnataka is the last big state left under its control following a series of losses. “Psychologically, in the perception battle, that both the Congress and BJP are going to mount, this is going to be very, very critical,” said Neerja Chowdhury, an independent political analyst. India's Prime Minister Narendra Modi addresses an election campaign rally ahead of the Karnataka state assembly elections in Bengaluru, India, May 8, 2018. A state of 60 million people, Karnataka is home to the Information Technology hub of Benguluru and was ruled by the BJP once before. The runup to Saturday’s vote saw both Prime Minister Modi and Congress Party leader Rahul Gandhi swing through the state in a high decibel campaign. Political analysts say a victory for the BJP will not just boost its prospects when it seeks a second term in office in 2019, it would also give it a key foothold in southern India. Although the party has expanded its presence significantly since it came to power in 2014, it remains largely confined to northern and western India. “It will acquire the reputation of a pan India party if it manages to get power in Karnataka,” Chowdhury said. The race is expected to be a tight one. The BJP has been somewhat on the back foot in recent months as it comes under pressure for not delivering on key promises of firing up the economy and creating millions of jobs for India’s young people. It is also under criticism for failing to control fringe Hindu groups. Political analysts say a defeat for the BJP would re-energize the opposition Congress party, which hopes to lead an alliance of regional parties against Modi next year and signal that it is on a revival path. 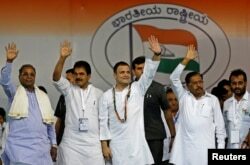 Rahul Gandhi, center, president of India's main opposition Congress party, waves to the crowd before addressing an election campaign rally ahead of the Karnataka state assembly elections, in Bengaluru, India, April 8, 2018. On the other hand, a loss for the Congress would be a huge setback for the grand old party that has ruled India for much of the 70 years since independence. “For Congress it is a do-or-die battle, if they lose Karnataka, they would have lost every state that went to the polls since 2014,” said Sandeep Shastri, vice chancellor of Jain University and coordinator of Lokniti, a political research group. Compared with the 22 states that are now controlled by the BJP and its allies, Congress only rules four. The polls will also gauge whether the popularity of the Indian leader goes beyond the Hindi heartland where he is credited with helping the party pull off several victories. Modi has won a reputation as a formidable campaigner, but his personal charisma remains untested in the south, where most people do not understand the Hindi language and where his election speeches had to be translated for the crowds. Opinion polls have forecast that there may be no clear winner. Votes will be counted Tuesday.